Callum Hawkins says he feels he will have a point to prove when he steps on the start line at the London Marathon. The race will be the Scot's first marathon since collapsing in exhaustion 2km from winning the Commonwealth Games title in Gold Coast last April. 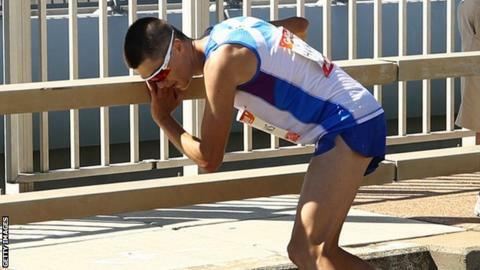 "I don't want to be known as the guy who fell over on a bridge; I want to be known as the guy who wins medals and runs quick times," he told BBC Sport. "I'll maybe have to prove that the Gold Coast hasn't done any damage." Last year, in temperatures approaching 30C, the Scot was leading the Commonwealth Games marathon when he began to look unsteady on his feet. Falling once, he got back up and continued before a second fall moments later crossing a bridge just over a mile from the finish line ended his race and he was eventually taken to hospital for treatment. "It was almost like going into a car that had been sitting in the heat all day," recalled Hawkins. "The last thing I remember was putting every ounce of effort to get back on my feet and I just couldn't do it - it was as if I was really drunk." Having previously come fourth at the World Championships and ninth at the Rio Olympics, Hawkins admitted being 'gutted' at missing out on a first major international medal in Gold Coast. But the 26 year-old feels he has learned from his experience in Australia. "It's going to be a good learning curve for the Tokyo Olympics, if I make it, because it will probably be similar conditions there. "I'll have a better plan and actually stick to it - which I didn't do in Gold Coast." In the year since his disappointment in Gold Coast Hawkins has chosen to concentrate on training blocks and racing shorter distances. Find out how to get into athletics with our special guide. And he believes that training at altitude in Arizona and in the heat of Mallorca will prepare him to make a statement on his return at the London Marathon on 28 April. "The aim is to run fast enough that people forget what happened in the Gold Coast," he said. "Some people have had big 'catastrophes' like that and they've not been the same. "My body is feeling good in training but it's just actually doing it in a race to say 'I'm back'. "I've run personal bests at altitude in training and I'm aiming for a PB in London. "I'm not sure where that'll get me but I reckon if I can run how I know I can I'll be pretty far up there.